(Nanowerk News) A research team comprising scientists from Tohoku University, RIKEN, the University of Tokyo, Chiba University and University College London have discovered a new chemical reaction pathway on titanium dioxide (TiO2), an important photocatalytic material. Fig. 1: Manipulation of an atomic defect using the probe of a scanning tunneling microscope. The reaction mechanism, reported in ACS Nano ("Tunneling Desorption of Single Hydrogen on the Surface of Titanium Dioxide"), involves the application of an electric field that narrows the width of the reaction barrier, thereby allowing hydrogen atoms to tunnel away from the surface. This opens the way for the manipulation of the atomic-scale transport channels of hydrogen, which could be important in hydrogen storage. Hydrogen has been put forward as a clean and renewable alternative to the burning of hydrocarbons and one of the great challenges of our day is to find an efficient way to store and transport it. 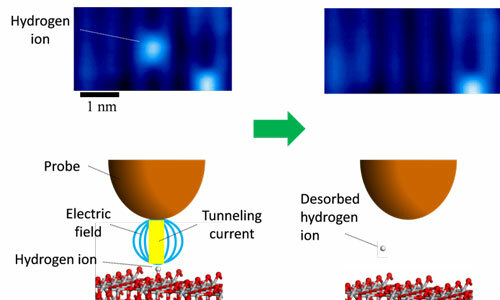 The team used scanning tunneling microscopy (STM) to directly visualize single hydrogen ions, a common atomic defect on TiO2 (Fig. 1). In STM, the surface structure of a solid surface is observed on the atomic scale by scanning a sharp probe across the surface and monitoring the tunneling current. Minato et al. were able to desorb individual hydrogen ions from the surface by using the STM probe to apply electrical pulses to the hydrogen. The pulse generates an electric field as well as injecting electrons into the sample. By using a new theoretical approach developed by Dr. Kajita, the team confirmed that rather than reducing the reaction barrier height, the electric field reduces the width of the barrier, thereby allowing the hydrogen to desorb by quantum tunneling (Fig. 2). Fig. 2: Conceptual images of the new chemical reaction explained in this work. Lead author Prof. Taketoshi Minato (Tohoku Univ. and RIKEN, currently Kyoto University) commented that "The new reaction pathway could be exploited in nanoscale switching devices and hydrogen storage technology. For instance, electric fields could be used to extract hydrogen from a TiO2-based storage device".